Prime Minister John Key is expected to outline new power arrangements for the control of Canterbury’s quake recovery in a speech to city business people on Thursday. This will likely set the framework for how the Government hopes to run the recovery past April next year. The first people to know about these proposed changes for how the city will run aren’t going to be the people who live here. Nope. It’s going to be the business people. Yeah, sure, this is just a lunch, and a safe place for Key to announce the changes. But it is so symbolic of the way this recovery is being handled, and in whose interests. If National cared about the people of the city, they could have held a joint announcement alongside the Mayor at the Council building. Or better yet, they could have gone to New Brighton and stood in front of the people who have been most affected by both the quakes, and the government’s handling of the aftermath. But no, it will be done in front of a bland group of rich white men, who have been the biggest supporters of the government’s direction. I’m not surprised, but that doesn’t mean I’m not disappointed as well. In a move that has been welcomed by the frequently ignored property developer class, the Finance Minister is expected to outline plans for a new focus on housing for cars in the Christchurch CBD as he delivers his 7th budget tomorrow. The plan will finally address the dire need for more carparks in the central city, a housing crisis which the government has repeatedly denied was an issue. While the details have yet to be announced, Rebuilding Christchurch understands that the initiative, known as the Central Road Users and Developers Entity (CRUDE), will be focused on the East Frame. Stage One will see all remaining buildings in the government-owned East Frame demolished and replaced with car parking. Stage Two will involve a state-of-the-art, 4,500-berth facility built for the protection and security of cars. Stage Three of CRUDE will involve the repurposing of “people parks”, such as Latimer Square and the Margaret Mahy Playground, into parks for cars. Given some of the recent bad publicity about the delays to key anchor projects, the government is very keen to see CRUDE up and running as soon as possible. Stage One is expected to be complete by the time the Finance Minister has finished delivering his speech; construction companies are working double-over-time to have Stage Two completed by Queen’s Birthday, when the Queen herself is expected to open the building by ceremonially driving her Bentley through a cavalcade of homeless people. Stage Three has no concrete completion date, as the repurposing of “people parks” is an ongoing project which the government is looking to roll out across the country. The Cameron report suggests rate rises could be in order – more income to allow the servicing of more debt. Despite earthquake levies being added by the previous council, Christchurch still has some of the country’s lowest rates. However, Manji agrees with Mayor Lianne Dalziel that a sale of council assets – or rather finding strategic partners to take a 25 per cent share in the holding company – makes eminent sense. This alone could knock $400m off that 2019 hump. A week is a long time in politics. However, I struggle to see how we’ve gone from “rates rises or asset sales to raise $400m” in August 2014 to “rase rises AND even more asset sales to raise $750m” less than a year later. And yet despite the Minister promising a review of the cost sharing event by December during the election campaign, we’ve not heard anything about this, which could ease some of the burden on the council. The ratepayers of Christchurch are being played, both by the council and the government, who are selling off productive assets and running down our social housing stock, whilst refusing to back down over less-than-essential anchor projects such as stadiums, convention centres and sports centres. Here’s a surprise: the convention centre industry that will directly benefit from the government using taxpayer and ratepayer money to build a convention centre are “optimistic” about convention centres. It makes us a “serious destination” – which I suppose means that until we get one, the rest of the country will just be laughing at us and our lack of convention centre. Bloody amateurs. Further details for the much-awaited convention centre are coming in July, Christchurch & Canterbury Convention Bureau manager, Caroline Blanchfield says. That is according to a Canterbury Earthquake Recovery Authority (CERA) statement she received. And that illustrates the larger problem with convention center subsidies — that they tend to generate meager public returns and generous private ones. So by all means, let us celebrate the beautiful new convention facilities we have built on Mount Vernon Square. At the same time, let us resolve not to dedicate any more public funds to a convention center arms race that no city can win. 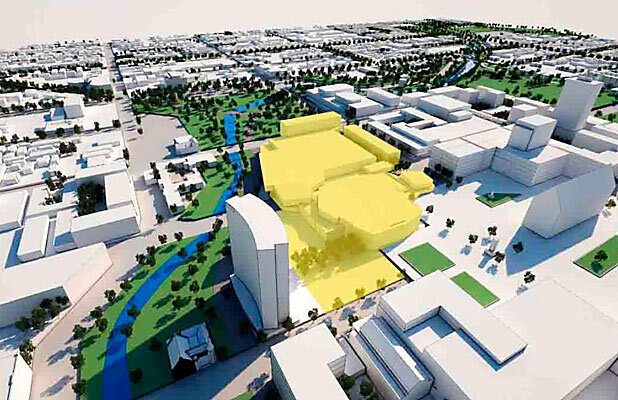 The Government’s key anchor project – a Christchurch convention centre – could be downsized after “market sounding” suggested a 2000-seat venue was too ambitious. This is promising news, as it shows that the government’s planned centre is too big for a city this size. It would also have a flow-on effect, if it results in a smaller convention centre being built. The current Blueprint calls for a new library, on a site a block away from the existing library. As I’ve written about previously, the existing library could be repaired for a fraction of what building a new one would cost. The main reason for building the new library is that the land will be required for the convention centre – however, if a smaller centre was to be built, it could be designed to accommodate the repaired library. This would save the council tens of millions of dollars. With the state that the CCC’s books are currently in, I think that is an option that should be seriously considered. This issue is really starting to heat up. What would be quite useful at this point would be if the opposition parties were to wade in and let us know what they would do, if they were in power after the next election. The River and the Cathedral. In the first two parts of this series I argued that the government made a mistake by keeping CERA so close to cabinet and central government, and thus lost the ability to change and adapt in the face of uncertainty. I also contended that since CERA was established in 2011, the wrong structure has been used and the wrong people have been employed. In this third part I will look in depth at one of the government-led projects to illustrate the larger points. Tomorrow, in the second half of this part (part 3.5), I’ll touch on the Cathedral and the recent risk that peace might actually break out on this troubled project. The Avon River Precinct and the Cathedral are perhaps the two most emblematic projects in the city. They adorn the city logo, and they have since the quake both been badly mismanaged and, sadly, come to represent the worst of the post-quake response -rather than the best that we have seen in other parts of the city. In the first instance, it annoys me that this project is called a precinct. A river isn’t a precinct; a precinct is an area in a city with walls or a defined edge. A river is a boundary (with many varied edges at different points) not something with arbitrary edges 30 metres from its banks. This isn’t really important, but the plan might be taken more serious if it didn’t abuse language so carelessly. After the quakes in 2011 the Christchurch City Council was tasked with developing the city plan. They started the Share an Idea campaign, got lots of public (but not much stakeholder) input, and then made their plans. These plans were then rejected by the government, who then developed their own 100-day plan. As part of this Council staff developed an idea to substantially reconsider and redevelop the Avon River within the 4 avenues. This would change the relationship of the city to the river, and to substantially upgrade its ecological and cultural value as a river. A brilliant idea, and one that CERA to their credit have always strongly supported. They have supported it to the extend that central government is funding the $100 million dollar project, almost as a gift to the city. This is great, and really quite exciting. CERA included this in the 100-day plan, writing a brief and putting it out for tender. This is where I’d argue that things started to go wrong. Their first mistake was that the brief was never developed with the people that use the river. This is a $100 million dollar urban space project, one of the biggest public space projects in New Zealand history. It is one that will probably define the future feeling of the city – and CERA in all their strange silo’d wisdom decided there was no need for public consultation at all. In the first part of this series I went into why public consultation is important politically. But it is important to point out on a design level that public input is not just a political imperative, it is how designers really understand what they are supposed to do with a project. No commercial or corporate designers would ever do something this big for their users without working with them first to develop the ideas behind it. It has any number of guises: brief development, user testing, participatory design, collaborative design, public engagement, prototyping, and many others. There are a hundred different ways that the public could have been involved and ideas could have been tested – many of which don’t take much time or money. Instead, we heard from CERA that “they don’t have time to talk to everyone in the city about the River”. Hands are placed firmly on foreheads and the project goes out for tender. This is a big project, and so all the best people in NZ submitted for the job – as did many world leading architecture and landscape architecture firms. Just before Christmas 2012 the winners were announced with much fanfare. To no one’s surprise Opus were picked as the consultants for the engineering, but to everyone’s surprise a medium sized and not very well-known British firm BDP were announced as the designers. You can look at their work here. I’ve heard from 8 sources that they were chosen almost entirely because they put the lowest fee bid in, and one person said this wasn’t the case. Both stories are depressing. In the first some of the top designers in the world and New Zealand were denied a role in a project because someone else said they charge lower fees. When dealing with housing or commercial projects fees are important, as the margins are so tight that the amount the designers charge can be the survival of the project. Not so on big projects like this; the difference in fees between firms will be marginal, but the difference in design quality can be huge. Why not spend an extra million on a project to make sure that the other 99 million is going to be well spent? This sort of decision making goes back to the point I made in the 2nd article in this series, that the people in charge of the CCDU and CERA don’t understand design and urbanism, and so end up penny pinching at exactly the wrong points. It’s odd because this is the logic that gives people like Marryatt and Sutton such big salaries, and yet for some reason it doesn’t apply to designers. If this wasn’t the lowest fee bid for the project, then god only knows why they’d picked them to lead it over some other project designers. Option A is misplaced values and Option B is incompetence. Take your pick. As the year goes on a number of developments start to unfold. It is announced that an Art Trail will be built along the river, and SCAPE is given the job of working with the artists on this. I’ve been in the education system for almost 25 years now and don’t have a clue what the last two points are supposed to mean – must be a project manager thing. Around October 2013 rustles of discontent start to be heard. 9 months of preliminary design work has been submitted to CERA, and they aren’t happy. It turns out not doing public consultation, under cooking the brief, and giving the project to an overseas firm with little cultural knowledge of Christchurch wasn’t the best idea. At this point alarm bells seemed to have started ringing. The Council staff are brought back into the fold, new designers are engaged to work ‘with’ the British firm, and there is belated effort to consult a slightly broader stake-holder group. There was even a temporary attempt to get some public feedback via the CCDU website. I was invited to one of these meeting, and I was astounded by the ratio of people that seemed to have been working on the project versus the quality of what was being presented. I was seated at table with a variety of stake-holders and a senior designer from BDP. When I tried to politely point out that the new Margaret Mahy park not only goes over the centennial pool, but also completely erases the Elsie Locke park next to this, and that this was a strange form of cultural erasure (weird because Elsie and Margaret were good friends) the senior designer said he’d only learnt of this 2 days ago. That’s over 9 months into the project. I can only speculate what other cultural assets of the city are being erased through bad management and poor briefing. Luckily the media got wind of this and CERA promptly jumped to attention – as they do when things become about publicity rather than participation. Originally the entire Avon-Ōtākaro River Area between the 4 avenues, and the entire east frame, was part of this job. I remember thinking at the time this is a huge risk giving that massive job to one firm, especially one from overseas. Now it seems the project is being split up into smaller areas along the river with slightly different groups developing each area, which is much more sensible. So what can we learn from this project? It confirms my suspicions from the first two parts of this series; that CERA and CCDU are not putting the right people in the right jobs and that stupid (and really expensive) decisions are being made as a result. The saving grace of this is that there is thankfully at least some quality control going on, so this project has been radically overhauled before it was too late. The sad thing is that it was so predictable and in the process the public has been denied a role in what could have been an incredibly meaningful and important part of the healing of the city. This was a chance for the people to collectively develop a new identity for Christchurch, rather than having it done on our behalf as it is presently.